Consumers are well-informed these days. They make 90% of their decision before they engage with a respective sales rep. Each customer has a unique buyer’s journey. With information sources like social media or a Google search, they land into an in-store or online to make a purchase. Marketers are focusing on getting noticed in between this mad race so that they somehow show up in the search at the right time with the right information. Taking into account the reviews on the internet and the unique features the product offers for his business, a buyer decides on the purchase. Many marketers accept that if the leads that are targeted through Facebook ads are the same leads in your Email marketing campaigns, then you are bound to achieve a better overall result. Facebook Marketing and Email Marketing are hugely effective. Hence when used in conjunction with each other they encourage further sales. These days Email Campaigns are very much personalized. But what if your subscribers are not interested in your emails? Even worse, what if anonymous visitors leave your website without subscribing or signing up? Fortunately, Facebook Ads sets a way for you! It helps you to get subscribers who are interested in your product or service and reinforce your brand to get much more email opens and click-throughs for your Email Marketing campaigns. You can display retargeted ads for those who leave without signing up. It helps in growing your email list. Assists in optimizing your emails. Merging email marketing with the potential Facebook marketing is one of the exceptional ways to gain and retain customers. Below are some of the advantages Facebook brings to your email marketing campaigns. PS: If you are totally new to Facebook ads and have never really created an ad, you can read this Facebook Marketing Guide from G2Crowd to know everything about Facebook marketing. Most of the subscribers who sign up for emails don’t actually open all the emails. This is one of the challenges email marketers face. 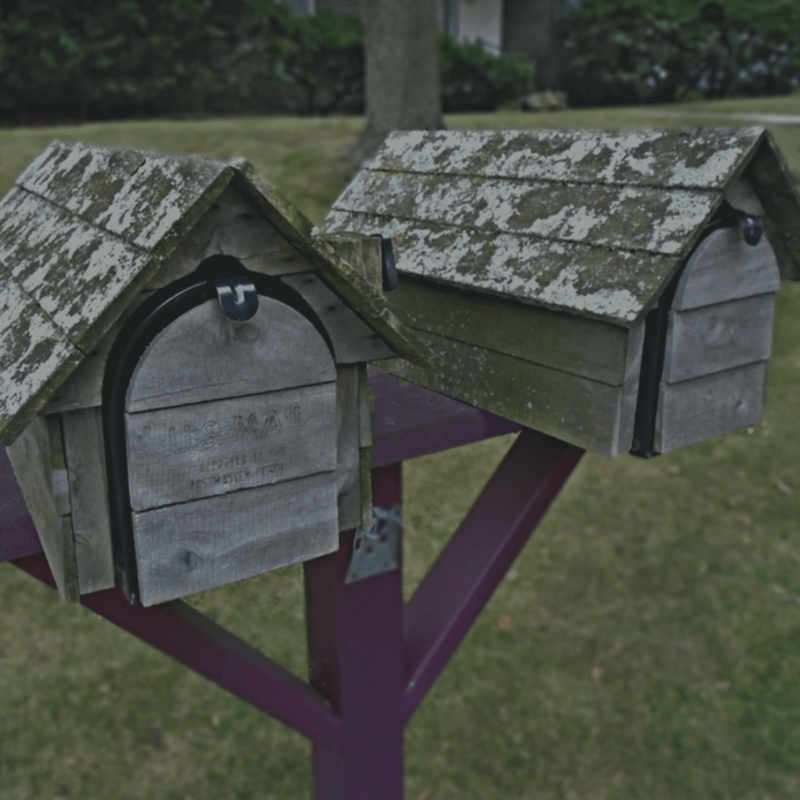 As a matter of fact, every email list has some inactive subscribers who don’t open emails frequently. Psst, I will tell you how you can play with their minds. Usually, people click on something they are aware of. So, whenever your subscribers come across your Facebook ads, your brand becomes familiar in their mind. 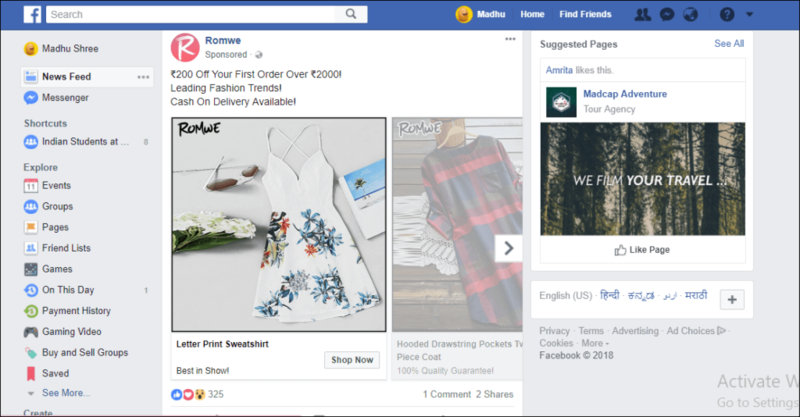 I have included an image of how Romwe tried to lure me on Facebook with its offers ? Well, the above image explains how Facebook ads help you deal with such lazy subscribers! Yes, it bids way to re-engage your subscribers through Facebook. Hence there are more chances of leads opening your emails and to make a purchase too! You can grow your email list by analyzing on your competitor’s Facebook page. I mean, you know that the people who like your competitor’s page are interested in the product. Obviously, because they are already following your successful competitor. With Facebook ads, you can target only those leads who are already fans of your competitor’s Facebook page. You may be designing great email marketing campaigns, but what can you do if your subscribers aren’t opening your emails, then all your campaigns head southwards. Facebook’s ads have the ability to throw limelight on your most read content! This is how WPbeginner decided to promote its blog in my Facebook news feed ? It gives you an opportunity to promote your most viewed blog. Typically Facebook ads have an extensive feature image that explains everything you’ve got to offer. This grabs their attention, and what’s more, you get many readerships. Sometimes subscribers who open your emails might not be willing to make a purchase at that time. But trust me, a gentle reminder in the form of a Facebook ad makes all the difference. Fortunately, you can exclusively target your Facebook ads to your mailing list. To emphasize on reinforcement of your marketing efforts, Salesforce says that those who saw both social media and email ads were 22% more likely to make a purchase. If you use Facebook ads as a part of a multi-prong approach to your marketing, then you should perhaps get ready to see some double-digit returns! ? You can make the best use of Facebook ads to check your email subject lines. This can be done by making your subject lines as ad headlines. Apparently, the ad that gets more number of clicks will perhaps bring more opens and click-throughs in your email marketing campaigns. However, if you have a smaller email list, this type of testing can be challenging. It is not new that customers prefer to check their emails and Facebook pages on a smart-phone. Now more than 60% of users are available on a mobile device. Sometimes because of your email formatting, it may be tricky for your subscribers to read your content on their mobile devices. Facebook takes this stress away. It inserts ads into a subscriber’s newsfeed through their own Facebook mobile app. This makes the content presentable and prevents the sorting of a messy inbox to read emails on the go. 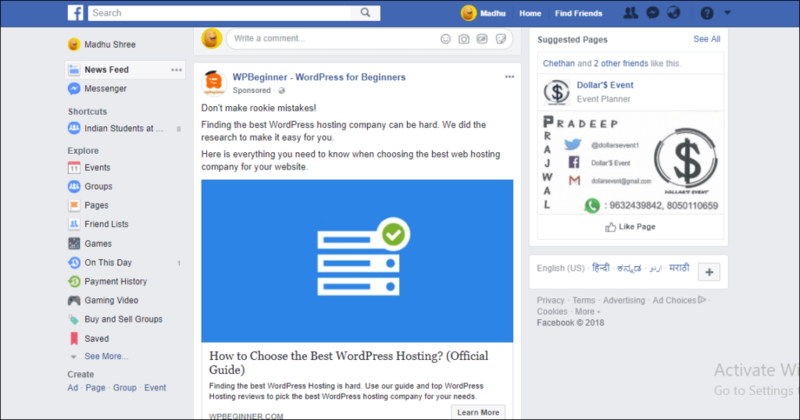 Moreover, Facebook also has Lite version of the application available which works over low internet speed and renders uniform marketing message compared to email. Emails are still the most excellent way to reach out to your customers. You can segment your email lists according to specific demographics. This adds more votes to email marketing. Email marketing presents an opportunity for more insistent sales pitches. Facebook marketing provides favorable circumstances to connect with new leads and make your business more visible on the internet. Although these different marketing platforms work fairly well on their own, joining these two forces will significantly boost your overall success. Facebook Ads are a great source for enhancing email campaign ROI. Great work Ankit! Very thorough! I believe Facebook ads is critical in increasing email campaign ROI. 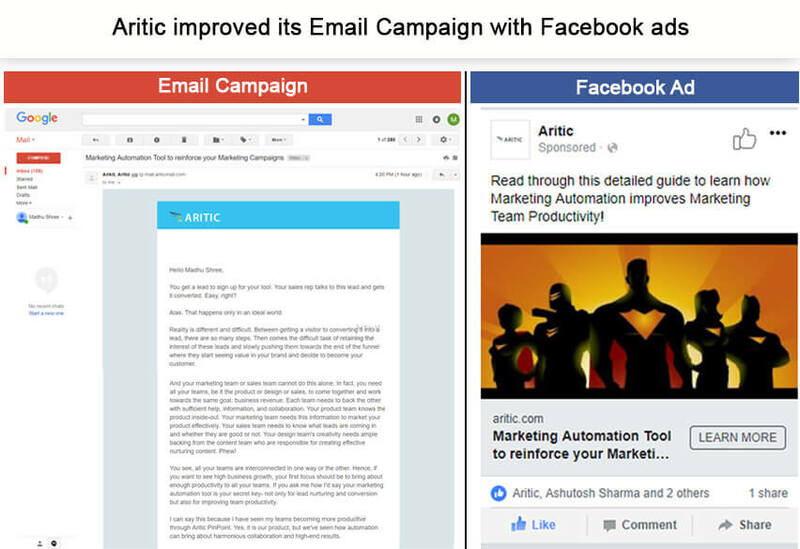 Hi, Thanks for sharing strategies on how to improve email campaign ROI with Facebook Ads sync. I liked the points which you have discussed in this article are perfectly applicable to my business. Ankit, you have put great efforts into sharing the useful aspects of Facebook sync. Thanks a lot. Facebook sync ads are vital elements to increase ROI for any business. Thanks a lot! Madhu for sharing this interesting article. Great blog Madhu, it was interesting to understand the useful aspects of Facebook sync, as it helps in increasing ROI. Thanks, Madhu for sharing the useful aspects of Facebook sync and as these can properly be utilized to increase ROI if you are targeting your ads to the right audience. The growth of social media marketing platforms has become a major part of building social signals that are very important in any SEO digital marketing campaign.